Create, by Disney.com, is an online entertainment portal that offers new ways to interact with Disney character art and graphics. Disney fans are now able to work with Disney art through applications that help create and design art work, comic books, music videos and much more. It’s also a great way to express creativity and communicate with other Disney fans. One all-new feature of Create is the Group Wall, where thousands of original pieces of art are created around a central them and then added to a larger mosaic. The first group wall is themed around, what else but Mickey Mouse – the one that started it all. The Group Wall mosaic is updated in real time so users can watch as new artwork is added, and it features unique tools allowing guests to locate their artwork within the mosaic. An innovative new community gallery called the “Group Wall” will launch on Disney.com Create. 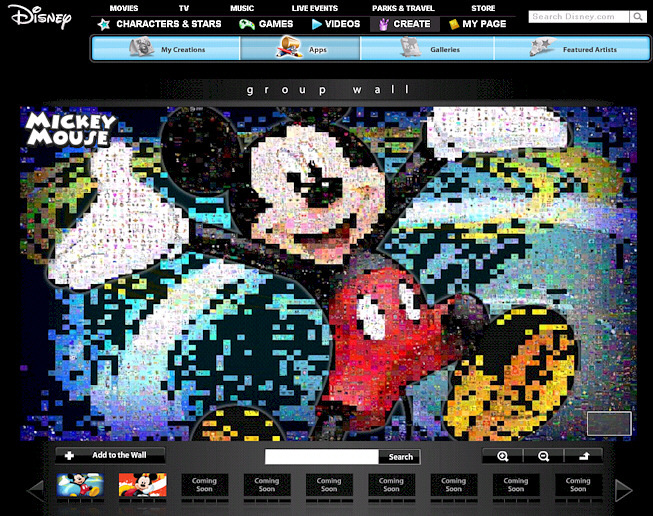 The first Group Wall theme is a “Tribute to Mickey” and will build a dynamic mosaic portrait of Mickey Mouse with user-generated content. Create Apps allow children to design artwork, comic books, music videos, animated pets and more, all using Disney characters and graphics. Craft a comic book using favorite Disney characters. Guests lay out pages using fun and wacky graphics, text and images to create their own rich narrative. Paint like a master artist, right in your browser, using tools, textures, and fun pens. Create a masterpiece that can be shared for everyone to see! Illustrate an animated online pet that can be individually styled and customized. Guests choose from a number of different animals, each with its own collection of pre-set animations, interactions, and accessories. Combine photos of favorite Disney stars with hip stickers and cool gear to create personalized images for use on a computer desktop, phone, inside a school locker, or any other fun application guests can dream up. Compose a harmonious mix of images, text, and sound. Guests create their own music videos using photos of Disney stars, their own text, and a choice of songs from artists such as Demi Lovato and the Jonas Brothers. Create an online art portfolio on Disney.com to share with friends, filling it with creations from all of the Create activities – digital paintings, comic-books, pets and more. Create was originally launched in August of 2009 as a way for artisis to have access to Disney character art and graphics so they could in turn create their own works of art and then share them with other users online. Since its launch, 1.2 million original pieces of content have been created within the Create environment.